But after ARRA, will there be adequate incentives? With bank funds -- by some estimates, in the trillions -- on the sidelines waiting for safe investments, the stimulus bills’ infusion of $65 billion in 2009 and 2010 saved the renewables industries. 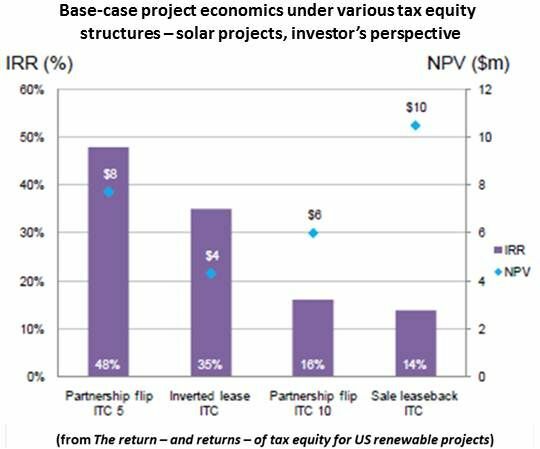 Maybe the loan guarantees didn’t always work out, but the solar industry is soaring thanks to the six-year extension of the investment tax credit (ITC), and the wind industry will get at least one more good year out of the three-year extension of the production tax credit (PTC). Both are far better off for the cash grant provision and the manufacturing tax credits in the 2008 stimulus bill and the 2009 American Recovery and Reinvestment Act (ARRA). Despite the occasional media hubbub, renewables investments have been sound. Jobs are being created. 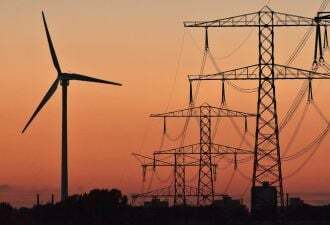 And even if the nation’s economic growth remains slow, demand for electricity will slowly increase and state mandates will drive demand for renewables, assuring returns on future investments. But wind faces a challenge. The stimulus bills’ cash grant and manufacturing tax credit provisions would appear to be history after 2011. Given Congress’s penny-pinching impulses, extension of the PTC beyond 2012 is in serious doubt. Meanwhile, those trillions sit idle while banks look for sound investments. “The total need for tax equity financing next year could be more than seven billion dollars,” the study states. That “exceeds the investment appetite of established tax equity providers, [... but] the 500 largest public companies in the U.S. alone paid $137 billion in taxes” last year. “U.S. corporations have historically made use of these kinds of incentives,” the study also reports, noting that Google and Pacific Gas & Electric have already gotten back in the renewables’ sector tax equity market. The PTC gives investors a 2.3 cent tax credit for every kilowatt-hour of electricity the project generates. The ITC gives investors a tax credit equal to 30 percent of their investment at the end of the project’s first year of production. This serviceable generalization is, however, inadequate for the many different kinds of wind projects being proposed. Ambitious undertakings, despite the potential for tremendous productivity, might more easily find backing as more tax equity returns to the PTC market. For example, Oregon’s 845-megawatt Shepherd’s Flat land-based wind project went ahead only after it won a DOE loan guarantee. 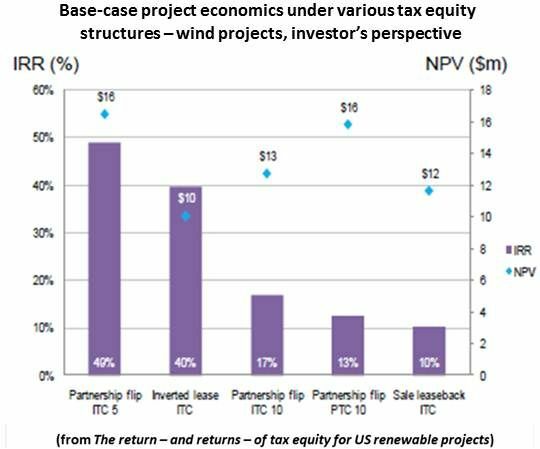 In the U.S. Southeast, projects aimed at taking advantage of new wind technologies that can harvest very low winds may not have the productivity to interest PTC investors, but might attract those who see value in an ITC-based investment that provides a big tax credit relatively quickly. 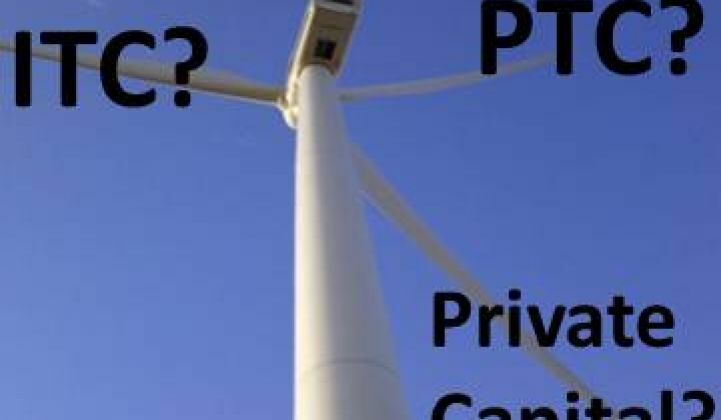 Bluewater Wind CEO Peter Mandelstam, who may be out of business if the tax credits are not extended, recently pointed out to GTM that neither DOE loan guarantees nor the PTC would serve offshore projects. Though they have enormous productivity potential, they take too long to get built to qualify for a DOE loan guarantee. They take even longer to provide a return on production to PTC investors. “What really focuses a banker’s attention is the prospect of closing a deal within six months,” Mandelstam said in calling for a policy that gives onshore developers a PTC and offshore developers an ITC. The Reznick Group study breaks tax credit investment into three primary tax equity structures: the partnership flip, the sale leaseback and the inverted lease. Each offers advantages and disadvantages. “It really comes down to what the tax equity investor is comfortable with,” Kemper said, “and what the developer is trying to achieve."